East Stoole Farm in Esole. 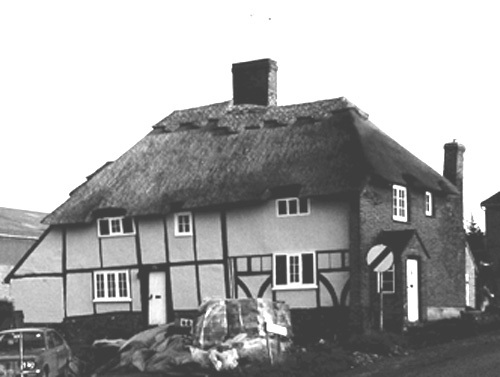 The thatched cottage at the junction of Mill Lane and Easole Street was once a yeoman’s house probably dating from the mid-15th century although the farm itself was much older. It was part of the Manor of Essewelle which belonged to the Convent and Abbey of St. Alban’s which had been granted the adjoining Manor of Eswalt in the early 1100’s. A modern view of the original, at least in part, East Stoole farm house which is the messuage referred to in the 1501 manorial roll. The 1501 Essewelle manorial roll recorded that: “Thomas Derbi holds half an acre of land in his messuage between the land of Joan Taylor twds the E & N and the Common Way (Mill Lane) twds the S and the Kings Way [Easole Street-Sandwich Road] twds the W rendering there at the Feast of St Michael the Archangel [Michaelmas, 29th September] 2d”. The King’s Way [now Sandwich Road] frontage to the farm. In 1501 the half acre corner plot enclosed the house and barns just out of view on the right. Adjoining to the north and sharing the King’s Way as a western boundary was a three-quarter acre plot of land, now the site of a car park and College Cottage, belonging to Joan Taylor. The old malt house and industrial buildings behind occupy an acre and a quarter plot with a messuage [house and out-buildings] then owned by Richard Welsche. The Derbys had been prosperous yeoman in Nonington for some time. Until the late 1470’s William Derby had leased a messuage and 161 acres of land at Kittington from the Archbishop of Canterbury’s Manor of Wingham, as had his father John, but had lost it due to non-payment of rent. In 1403 John Derby had bought William Mot’s land at Frogenham [Frogham] in the Manor of Fredville, and William Derby was recorded in the 1377 Essewelle manorial roll as holding a cottage and land of the manor. Thomas Derbi owned some 19 acres or so held of the manor for which he paid 7s 3 ½ d [36 ½ pence] per annum in manorial rents as well as suite of court [attending the manorial court every three weeks]. 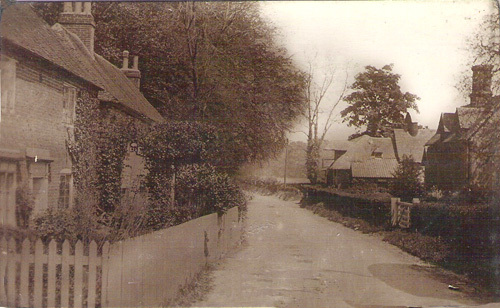 Much of the land was small pieces in Esole Fields [the large open fields on either side of Mill Lane], and he would have owned and rented other land in Nonington. In May of 1667 the farm was the subject of a mortgage between James Osbourne of Biddenden, clothier, and Sara Reynolds of St. Paul’s, Canterbury, “widdowe”, and consisted of “Messuage, barne ect. & several pieces of land, earable & pasture in Nonyngton contg. by est. 46 acres”. 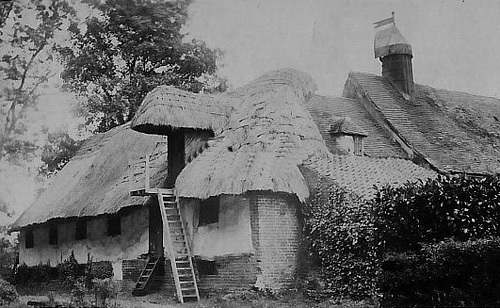 The farm appears then to have belonged to Constance Jarman, a Canterbury widow, as it was inherited on her death by James Osbourne who in January of 1670  sold it to Mary Lindridge, the mother of Thomas Seales of Marden. Some years later, in May of 1676, the farm was part of a marriage settlement between: Thomas Sceele of London gent., in the first part; and Edward Mayes of Norwich, grocer; Jeremiah Osbourne of Norwich worsted weaver; and Robert ffransham of Norwich, worsted weaver, in the second part. The settlement was as follows:- “Reciting that Mary mother of sd Thomas Sceeles now wife of Alexander Lindridge of Biddenden clothier stands seized of for her life:- Parcels-Messuage called East Stoole 1 barne, 1 stable ect., 1 garden, 1 orchard, 2 closes & 11 pieces of land, arrable & pasture contg. by est. 46 acres in Nonyngton late in the occupation of Robert Payne being late in the possession of James Osbourne of Biddenden, clothier, before of Constance Jarman, late of Canterbury, widdowe deceased, and by her will descended to said James Osbourne. Remainder after death of sd Mary Lindridge to sd Thos Sceeles. Settlement of his remainder by Thos Sceeles on his wife Mary &c”. William Hammond was in some financial difficulty at this time and in April of 1707 sold eight pieces of land amounting to some 16 acres and situated in Esole Fields to William Turner, the owner of Esole Farm [White House farm] for £160.00. In September of that year he raised a mortgage for £200 with Robert Eason, a Ramsgate mariner, on “Messuage or tenement called Eaststoole together with one maulthouse (lately erected ) 1 millhouse (not a wind mill but a grinding mill to process the malt for brewing and probably built at the same time as the malt house), 1 barn, 1 stable with the outhouses &c. 1 orchard, 1 garden and 7 pieces of land arable & pasture thereto belonging containing by estimation 30 acres in the parish of Nonington in the occupation of said Wm. Hammond & of Thomas Duning and Henry Hopper which said messuage land & pres said W.H. (with other lands) lately purchased of Thomas Sceelles senr. & Thom. Seelles junr”. Shortly afterwards the Hammond men made some financially beneficial marriages and the family’s financial problems were resolved and East Stoole remained in their possession. The malt house, built in 1704. The farmhouse and adjoining barn and the 1704 malt house are now dwellings, and a walled garden built by the Hammond family to supply fresh produce to the old and then new St. Alban’s mansions was built to the east of the malt house, probably in the late 1700 or early 1800’s, and has survived virtually intact. 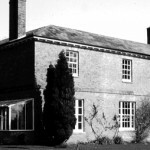 A house was built between the barn and the malt house for a gardener which was sold off in 1938 to the then newly formed Nonington College, which in turn closed in 1986, and was used as accommodation for college staff and subsequently became known as College Cottage. It’s from an aerial photo of the area taken in the early 1970’s. I was given a copy of it a while back.